"The golden snippet of our way" and "Sakhalin Island". Moscow, Krasnye Palaty gallery, November 2002. We dream of it all our life. At first it seems to us that once we perfectly knew, how it becomes, how the habitual world is dissolved, breaks all links, and in a flash we appear in completely another condition. Sergey Emets - the artist, "generator of the ideas" and studio's "core creative person". The author of the Free Format concept, the paintings and graphic art, photo and video materials, scenarios and texts for the films and albums. Was born in Leningrad, Russia (now St. Petersburg) in 1965. Graduated from the St.Petersburg's Russian Academy of Arts (Institute named after Repin). A member of the Artist Union of Russia since 1995. Currently lives and works in Moscow, Russia. Sergey Emets was born in Leningrad, Russia in 1965. In 1991 he graduated from the Russian Academy of Arts (Institute of Repin), where he had completed a four year course of study first on the architectural department and then five years on the art painting faculty. In 1987 he started to travel a lot in Russia (in such cities as Torjok, Ostashkov, Tver). Much of the experience got in this travel, Sergey used in his Russian series of pictures. In 1987-1989 he went to the Ural, Siberia and to the Far East; in 1990 - to Sakhalin, and in 1991 he arrived to Kamchatka. In 1992 he took part together with three other graduates of the Academy of Art in a big exhibition in the local gallery. In 1993 he held a personal exhibition in the Hall of the Artist Union of St. Petersburg. In July 1993 he arranged several exhibitions in the cities of South -Sakhalin, Okha and Nevelsk. 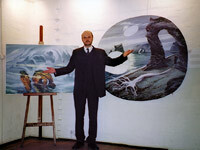 In 1995 he brought the whole exhibition to Vladivostok. In December 1995 he became a real member of the Artist Union of Russia. 1998. There was a large personal exhibition of his pictures in the Central Exhibition Hall of “Manezh” in St. Petersburg from 22nd of October till 18th of November called “Playing with the wind”. There were presented more than 150 paintings, made in the period from 1988 to 1998. 1999. His discovery in the wold of art: Free Format - the pictures of free form (patented later on). 2000. From 29th of February till 20th of March he had a personal exhibition in the Moscow Central House of Artist called ”Free Format”, where there were shown pictures of a new form for the first time. 2001. The personal exhibition "Line of irradiation. Free format" in the Theater Gallery of Moscow's Bakhrushin museum. 2002. The personal exhibition / presentation of the documentary "Oval of Sakhalin" in "Moscow Red Chamber" gallery. December 2002 - the participation in "Art Manezh" in Moscow Central Art Hall "Manezh". 2003. The personal exhibition "Free Format" in Moscow Tushino gallery. 2004. The personal exhibition "Chukotka's reflections" in th Art gallery of the museum center "The heritage of Chukotka", city of Anadyr, Chukotka. 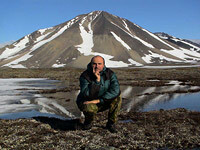 Invited by the administration of Chukotka's region, during summer 2003 and 2004 Sergey visited Chukotka. The people living in Lavrentia, Lorino, Egvekinot, Bilibino became the visitors of the reporting exhibitions. These contacts with the culture, traditions and history of the most distant area of Russia opened the new feelings, ideas and horizons for Sergey's creative personality. Since 2004 to 2006 Sergey together with Ludmila Eremina created a series of short photofilms devoted to Chukotka's nature: "Chukotka - the Territory of Beauty", "Eyes to eyes", "Lights of fall", "A land with atomic heart". In 2006 - photo album "Chukotka - the Territory of Beauty", in 2007 - the full-length film "Radio North" about Far East travels. January 2008 - new Moscow exhibition in Council of Federation's exhibition hall. 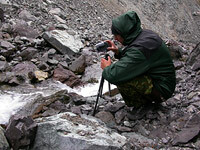 Summer 2007 - the second trip to Kamchatka, the second "Kamchatka's creative period". In February 2008 Sergey and Ludmila finished the 45-minute film "Such a sweet name - Kamchatka". April 2008 - exhibition "Kamchatka's impressions" in Kamchatka regional art museum, city of Petropavlovsk-Kamchatsky. Summer 2009 - another trip to Sakhalin. In November 2009 Sergey and Ludmila finished 365-page photo album - calendar "Eternal Sakhalin". April 2010 - another photo album in the format of eternal calendar - "Kamchatka" - was launched. Three of the albums "Chukotka - the Territory of Beauty", "Eternal Sakhalin" and "Kamchatka" made a start of the series "Russia. The Far East". Summer 2011 - again Sakhalin, again Kamchatka. Spring 2012 - plans of the secon edition of Sakhalin photoalbum. Working with layout. Photoblogs (in Russian, please use online translator) Items with tags "Kamchatka", "Sakhalin", "Chukotka"